Born in Cleveland, Ohio, Philip Johnson was an ambitious young man. He attended Hackley School of Tarrytown, New York. He then attended as an undergraduate at Harvard University and during that time, he took multiple trips to Europe which consequentially interfered with his studies however did spark his interest in architecture. Johnson incorporates contemporary traits into his designs. He sometimes uses full glass skins with these designs to give more modern polished feel while keeping the unique shapes the contemporary designs already hold. By the time he was 34, he went back to Harvard to study architecture to solidify his profession. At the times of pre-world war II, Philip was open to his positive views towards Nazism and Anti-Semitism. As a result, he was suspected of being a spy by the authorities. However afterward, he expressed remorse to his previous beliefs. 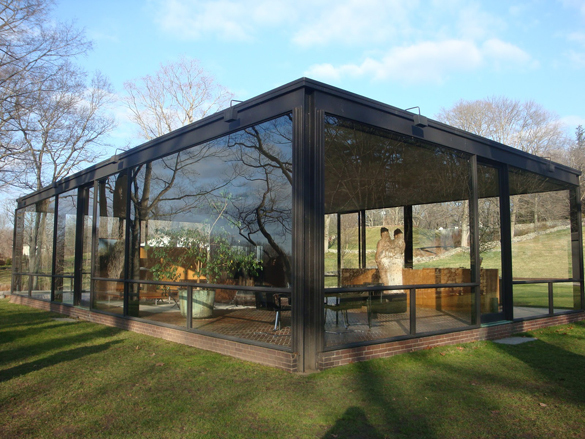 One of Johnson’s most influential works was his glass house taking on the role of being his own private residence in New Canaan, Connecticut. He was known for several builds, both large and small from his glass house to tall skyscrapers like the Gate of Europe in Madrid. Johnson never really worked alone with his projects, partnering with several people in his builds. The current style of international bothered him and wanted to add shine to his designs. One good example is the PPG place in downtown Pittsburg. It features a crystalline “crown” with sharp edges to give an invaluable look. An international style example would be the Amon Carter Museum which opened in 1961.It’s symmetrical and boxy style emphasized the style and gave a comfortable feeling of cleanliness mixed with artistic details. Though Johnson and Carter never actually met in person, they still managed to bring forth a building worthy of housing a large collection American Art of the 20th century. As the founder Department of Architecture and Design of the Museum of Modern Art in New York, he also supported new styles; collecting pop art pieces as well as help the world realize their artists such as Andy Warhol. As the times changed, so did his designs. His works became more and more simple and cubed. The influential architect worked all the way until he reached age 98 in October of 2004 for retirement. Unfortunately, he was unable to enjoy his time when he passed away on January 25, 2005 not even a year into his retirement. He died in his sleep in his glass house. Although he might be gone, his creations and legacy still stands from his towering buildings to the small peculiar houses. Built in New Canaan, Connecticut, the glass house which served as Johnson’s residence is still to this day one of his most influential works. It is constructed with charcoal painted steel beams encased with glass, which sits upon 10 inches of brick.